Information subject to change. ALWAYS check with event contacts or see printed event brochures to verify race information. Last updated Jan 5/15. Series event directors, click here for important information about entry forms & results formatting, and a note about gun time versus chip time. Fees: $20 by Dec.11, $25 by Jan.7, $30 by Jan.10, $35 day of race. BCA deduct $3. Students deduct $5 from pre-race-day fees. Features: Fast course. 2015 BC 8k Championships. $1750 in prize money. Ferry fares may be covered through the Sporting Life on the Coast program. Transportation available to and from the ferry for high performance athletes. Part of the Frontrunners Island Race Series. Fees: $28 online by Dec 14, $35 online by Jan 28, $40 Jan 30-31. No race day entry. BCA deduct $3. Features: Fun and fast 8k to kick off the year with hot soup headlining the post race festivities! Flat route in scenic Steveston. Also part of the Lower Mainland Road Race Series. Fees: $65. BCA deduct $3. Registration opened Nov 5, sold out quickly. Competitive & Elite entries open until Jan 24. Features: Provincial Half Marathon Champs. Very scenic route goes out on the Seawall, to English Bay, through Stanley Park and back again. Bagels, fruit, soup, juice, yogurt, water and coffee will be available at The Roundhouse Community Centre. Cash prizing to overall top 5 men and women; course record bonus. Fees: $20 by Feb.7, $25 by Mar.3, $30 on Mar.7, $35 day of race. BCA deduct $3. Features: Part of the Frontrunners Island Race Series. Fees: $28 by Jan 2, $33 until Jan 23, $35 until Feb 24, $38 until Mar 11. Team entries $4 less per person. BCA deduct $3. Hooded sweatshirt $35; Race T-shirt $20. Features: Fast and scenic loop of Stanley Park. Irish theme; post-race party. Cash prizing. Also part of the Lower Mainland Road Race Series. Fees: $26 pre-registered, add $10 race day, BCA deduct $3. LS Tech Shirt $20. Features: “Flat and fast”, great PB certified course in a quiet residential area near river and golf course. Also part of the Interior Road Running Series. Fees: $20 by Feb.23, $25 by Mar.19, $30 on Mar.21, $35 day of race. BCA deduct $3. Features: Part of the Frontrunners Island Race Series. Pre-race dinner Mar.21. Fees: $49 by Jan 31, $54 by Apr 14, $60 Apr 16-18. No day of race entry. Fee includes T-shirt. Vancouver Sun Subscribers get $2 discount. BCA deduct $3. 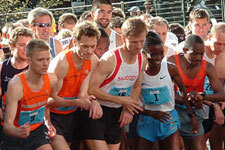 Features: Scenic course in downtown Vancouver and along the waterfront. One of North America’s largest road races, Expo, “Mini Sun Run”, post-race party. Fees: $35 by Jan.31, $40 by Mar.31, $45 by Apr.22, $50 Apr.24-25. No day of race entry. Fee includes T-shirt. Features: Very scenic route, on-course entertainment, Kids/Family Fun Run. Half Marathon distance also available (not in series). Fees: $25 by May 17, $30 late and day of event. 19&U deduct $3. T-shirt $13. BCA deduct $3. Features: Scenic Shaughnessy course, great draw prizes, 5k poker walk. Also part of the Lower Mainland Road Race Series. Fees: $25 by June 4; $35 day of race. BCA deduct $3. Features: Beach-front start and finish, new loop course. Also part of the Lower Mainland Road Race Series. Fees: $33 by May 19; $38 by June 17, $48 race day. $5 discount for age 15&U. Tech shirt add $24. BCA deduct $3. Features: Provincial 5k Championship. Summer evening race; post-race BBQ/party. Kids’ Mile (6:30) and 10k race (7:15) also offered. In support of Juvenile Diabetes Research Foundation. Also part of the Lower Mainland Road Race Series. NOTE: only the 5k results count for points in the race series. Fees: $25 pre-registered, $35 day of race. BCA deduct $3. KRC member deduct $3. Fees: $30 by July 4; $35 late; $40 day of race. BCA deduct $3.